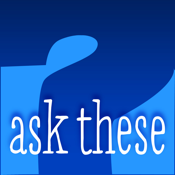 "Ask These" is an App for your iPhone or iPad that contains a comprehensive list of questions that you should ask before making decisions that affect your day to day activities. By asking the right questions up front, you can save yourself a lot of headaches later on, and perhaps even save yourself some money. Currently there are over 50 categories and more than 1,000 questions. These "questions you should ask" are constantly growing as users add more categories and questions. It really is "one stop shopping". Since the specific answers to many of these questions depend upon a variety of factors (such as your location, preferences, and circumstances), answers are not always provided. There are, however, usually some comments about why a particular question is important. In addition, by touching a particular question, you can enter a note containing specifics that you learned about that question, or perform an internet search for additional information on a category or question.